The centrifuge filter bag uses centrifugal power in a way like in a drum centrifuge, but in this condition the partition of the centrifuge is the medium that allows the filtrate to pass by whereas sending-off the solid particles on the exterior. These solids can be kept to clean and then separated incessantly through an unloaded knife and set free from the specific methods. Filtech Fabrics is capable of supplying centrifuge cloths to go with all daily designs of centrifuge filter bag. The whole fabrics are thermal incised from automatic prototype profiles to ensure exactitude cut and repeat ability. Filtech Fabrics is specialized in offering the best variety of centrifuge filter bags that you can employ for the range of applications such as fertilizers, chemical processing, food processing, etc. We offer different types that are useful in getting the elucidations of our filtrations. For the best filtration we produce high quality powder assortment predictable bags. We provide a broad range of filter bags that are produced from quality substances and are in convention with the global quality norms. These filter bags are broadly recognized in the market for high performance and sturdiness. These powder collection predictable bags are composed of minutely chosen media according to the process business. Different kinds of media like mono filament, woven filter fabric, needle felt and multi- filament are employed to produce these bags. With the help of filter cages, these are kept in dust or powder collector. These bags are more capable in reducing dust or powder release level according to the requirement of industries. Via the top chamber all the solid particles get dropped. With the assistance of shaking device or reverse pulse jetting method, the particles at the outer surface get accumulated at the base. Employed in different industries for filtration task, these filter bags are obtainable at most viable rates. Centrifuge filter bags are full-bodied in taking out the jellylike and solid particles. These bags are composed of polyester and polypropylene. Broad range of filter bags provides superb filtration and steadiness. Centrifuge filter bags are adaptable with customized size. These filter bags have different heat compatibility. These bags are simply dispositional and have big dust holding capacity. A wide range of qualitative filter bags is offered by us, which mainly involves lifting kind bags, collar and without collar kind bags. Our customers can benefit from us with an exclusive range of centrifugal filter bags. These bags are fabricated through high rank cloth that is bought from recognized and reliable dealers. It is broadly used in different industries and is highly valued by the customers for its toughness and long life. The opening of these filters is like a circle in outline and is shown at the manufacturing leading prices to the customers. We are very well considered as one of the main centrifuge bags producers, established in India. 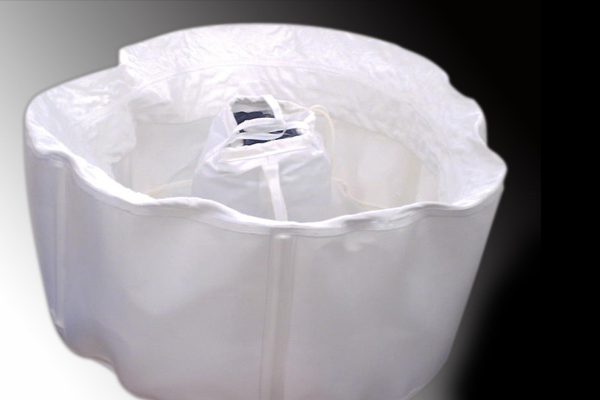 These centrifuge bags are present in different sizes and dimensions. They are hugely employed in different industries such as bulk drugs, fertilizer, food processing industries, etc.